I’m trying to imagine this experience from a dog’s-eye-view. Say you’re Maggie or Rosie. You’ve lived a lush life (OK, you’ve been spoiled rotten) in the U.S. and you haven’t had to think about much except maybe whether Mom and Dad will ever get that dinner into the bowl, or when you’re getting out for your next walk. Then everything changes overnight. You’re locked in a kennel and placed in a noisy and dark cargo hold. Many hours later, you’re rolled out of there and onto a rattling conveyor belt. Damn, it’s hot and humid. You’re thirsty, and you need to pee badly. But there are two familiar faces waiting for you on the other end. 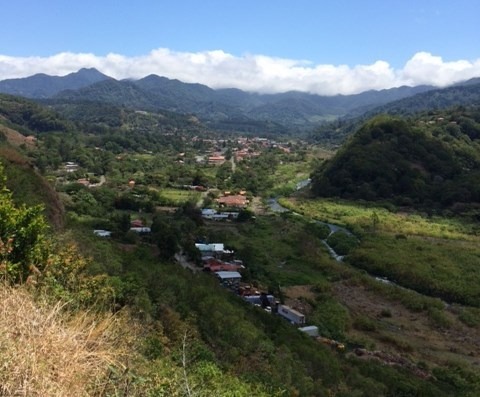 You spend the night in a hotel room (OK, this is a little more familiar – Mom and Dad have taken you traveling lots of times) and then the entire next day in a bumpy car, traveling across Panama. It’s not so bad. You have plenty of water and the nice people driving make lots of stops so you can pee. You can look out the windows at passing scenery that’s different from anything you’ve ever seen. And Mom and Dad are right there with you the whole way. That evening, you arrive at your destination and it’s nothing like anything your little doggy brain has ever imagined. The new and exotic smells! The beautiful lush greenery! The BLACK squirrels! The little brown beetles that are so much fun to chase! And RAIN. You sure didn’t see much of that in California. and you’ll begin to understand the excitement and – yes, let’s be honest – disorientation that we feel after exactly one week in Panama. This time last Thursday, we were all napping in our room at the Albrook Inn in Panama City, after many insane days of last-minute packing, sorting, selling, and shipping and then an overnight flight from LAX. The next day, Jose and Lucy of Golden Frog whisked us across the Centennial Bridge (one of the newer bridges across the Panama Canal) and out of Panama City for the drive to Boquete, which took about eight hours. Last Friday was the start of one of Panama’s biggest three-day holidays, Labor Day weekend, which was both bad and good news: heavy traffic getting out of town (hordes of PC locals headed for the beach and resort areas), but also a somewhat easier time with the infamous highway construction between Santiago and David since the road workers were all off for the day. Even with the holiday, the construction zone was slow and jolting. We had thought the highway project was much further along, but after traveling it we realize it’s at least a couple of years from completion. For us, it seems well worth the $150 or so to fly round-trip from David to PC if we have business there, at least until the road is complete. 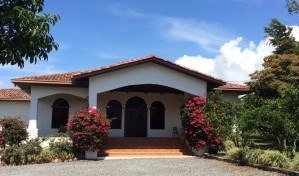 Our new home, at least for May, is Casa Valhalla – a small but comfortable vacation rental a half-mile from downtown Boquete. We had planned on being here through the end of June, but once again the stars aligned for us and we found a fantastic house to rent longer-term beginning June 1. It’s the beautiful three-bedroom home of a very friendly and helpful Canadian couple who have gone back to Canada until the end of November. We had hoped to rent a house for at least a year, but, as Handy Andy the property manager pointed out, we’re so new that we should spend those six months getting better oriented to different areas before we commit to a longer-term rental. Besides finding a house to rent, we’ve spent the last week getting the kinks worked out with our mobile phones, checking into local health insurance, and figuring out where to buy stuff. Yes, you heard that right – but “stuff” in this case means mostly food – the best and cheapest produce, where in the heck to find distilled water (still working on that one), the best fresh seafood (including some jumbo shrimp to die for that we had for dinner last week), and where to find OTC allergy medicine that doesn’t cost a fortune (for some reason I’ve been sneezing my fool head off since I got here). Speaking of produce, might I say that we have reached fruit and vegetable nirvana? 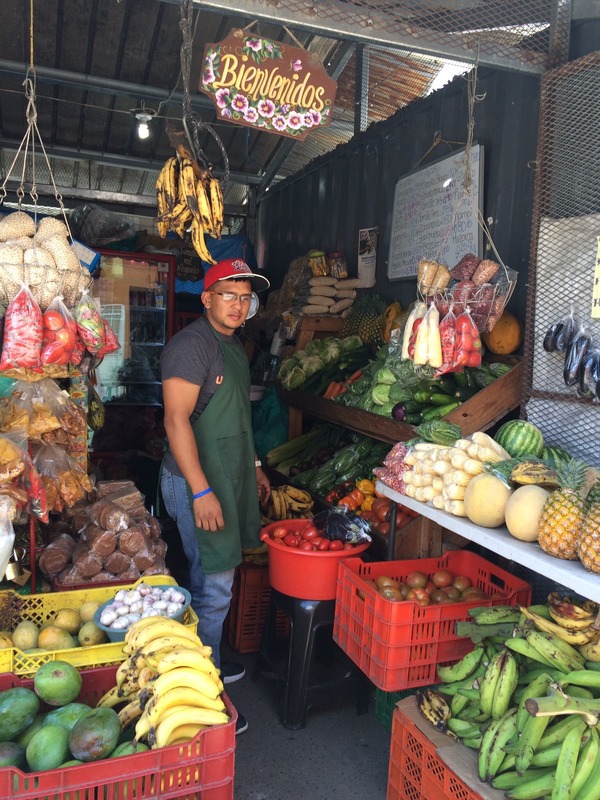 The variety, quality, and low cost of the goodies here are like nothing we’ve experienced since we were cruising in Latin American aboard our boat in the early 2000s. Fifty cents for a pineapple, anyone? And these pineapples are juicier and taste fresher than anything we could ever get back in the states. True story: we give the girls a can of green beans every night with their dinner (I told you they were spoiled). Back home, we’d buy a couple of cartons of green beans at Costco and they’d last a month or so. Here, the best price we’ve been able to find for a single can of green beans is $1.45. Looks like we’ll be buying fresh ones and cooking them up for the little darlings instead, which will probably be better for them anyway. 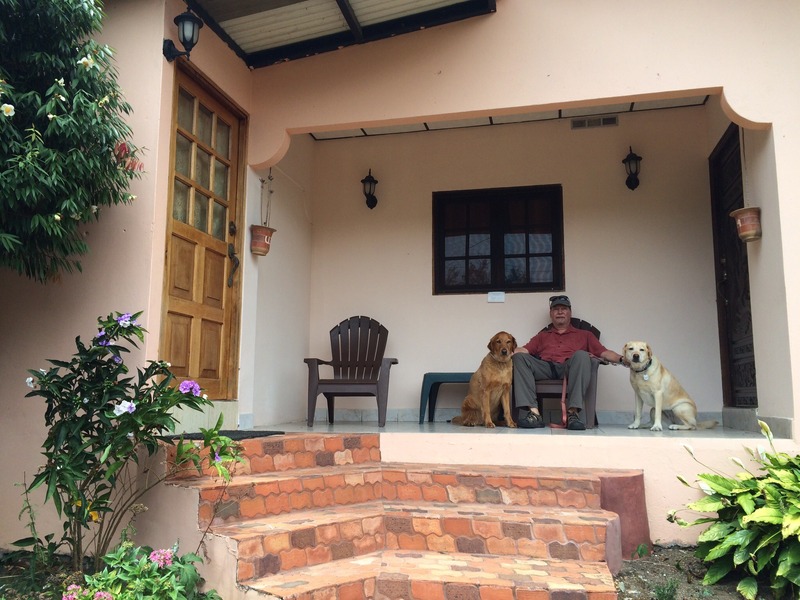 SO – here I sit, with various dogs shoving their heads in my lap, reflecting on our new life here in Panama. Because I’ve been off work for the most part this week, it feels like a vacation to me. It hasn’t quite sunk in that this is no vacation – it’s our new life. We had a bit of an epiphany about that today when we were walking around in downtown Boquete, a town we’ve visited several times as tourists. Today, we were poking in and out of shops and making mental notes of which ones were best for buying which things, and it occurred to us that we’re now thinking like locals, not tourists. Even better, we ran into two different people on the street that we know. That would NEVER happen in Long Beach, Beaverton, Tampa, San Francisco, or anywhere else we’ve ever lived. I’ll do a separate blog post on the friends we’ve already made here, but for now suffice it to say that this is one of the friendliest places we’ve ever landed in. I know it’s become an overused cliche, but LIFE IS GOOD. Fabulous! You make my day every time you send out a new post! Really! Hi, I am enjoying your story very much; considering I too will be retiring by Sept 1, 2015. Please, it would be helpful to many if you also blogged about who/what/where/how/why, you chose that mobile carrier, this health insurance provider, all the “stuff” for those relocating and retiring. Learning the “in’s & out’s” and processes from those who are practically doing it in real time would be great. Keep em’ coming, love the adventure! Absolutely. We learned so many valuable things from fellow bloggers and we’re hoping to pay it forward with info in our blog. In an upcoming post, I’ll give a status report on the things we’re working on. We’re still researching health insurance. It turns out that you need to have a visa or at least visa paperwork in progress to get the best plans. And we’re not ready to tackle the visa thing just yet. When we were here a year ago, we bought a basic little cellphone at the Cable & Wireless office. Last week, we were able to get it recharged with the same phone number. Also, John was able to unlock his iPhone and get it set up with a SIM card and local number at Cable & Wireless. My iPhone is more complicated since I’m on my company’s AT&T contract until December – I won’t be able to unlock it until then. One option for me might be to buy a schmancier Android smartphone from C&W so I can at least send texts. So why Cable & Wireless? Last year there was a lady there that speaks fluent English and was a favorite with the gringos because she made the whole phone-getting process so easy. Turns out she has now retired – but we were able to manage just fine the other day with our limited Spanish. Anyway, I’ll be writing more about this later so stay tuned. When do you think you’ll be getting down here? Let us know if you have any other questions. Oh wow what a GREAT posting! So glad you guys and gals are settling in so quickly! Can’t wait to visit! Bud, we’re THRILLED that you’re coming! Unless someone sneaks in ahead of you, you’re officially our first visitor. See you soon! Welcome to Boquete. Glad Jose worked out well for you. We use him at most needy opportunities. Don’t have much left to do in PC since our Pensionados and Cedulas are done, and my drivers license. And with Copa now flying direct from Tocumen to David, the taxi rides and stay over are generally not needed either. 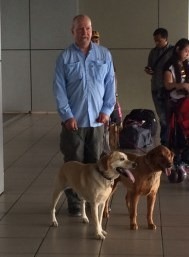 Sadly we’re back in the U.S. right now helping family, and scheduled to return on June 2. Will have to schedule a meet up for coffee. Favorite place is Kotowa at the Los Establos Plaza near Big Daddy’s burgers and more. I’m sure you found the one at the Tourist center when you took your picture from the view point. Every one takes that picture. I have 2 or 3, and a short video. We also walk there from our apartment for coffee sometimes. BTW, if you are needing a rental car, or looking to buy, Value Motors is in the Paso Alto building (our apartment is upstairs). Fiona is the owners daughter and usually is there in their office. Know them well and friends who have purchased and we rent when needed. You’ll enjoy her British accent. The building is about 1/2 mile out of town past the Tourist Center on that same side of the highway. There’s a Ferreteria (hardware) store and the El Dorado grocery across the street in a long building ‘strip mall’. Thanks, R&C! We’ll pop in and introduce ourselves at Value Motors. We’ve driven by it before – didn’t know you live in the apartment there. Glad to hear you’ll be back June 2 – let’s definitely get together for a meet. Will need to call first. Since all the recent break ins, etc. we’ve been locking the lobby door to the stairs up to the apartments. There are 4 on the top floor. Just happened to catch this note on an app update. Don’t go to WordPress that often. Hi. We have appreciated hearing about your experiences; the good, bad and sad. We are coming back to Panama to have a really close look at it’s potential for retiring to. We want to stay for five months and check out various parts of the country. Did you have any advice about getting a vehicle? We are wondering about longer term rentals vs buying/selling. Loved reading about what you have been doing, and learned some new things. Love, love the girls looking out the window (at BLACK squirrels?). Thanks! That picture was the inspiration for the whole thing. It’s been so much fun watching them explore their new world. 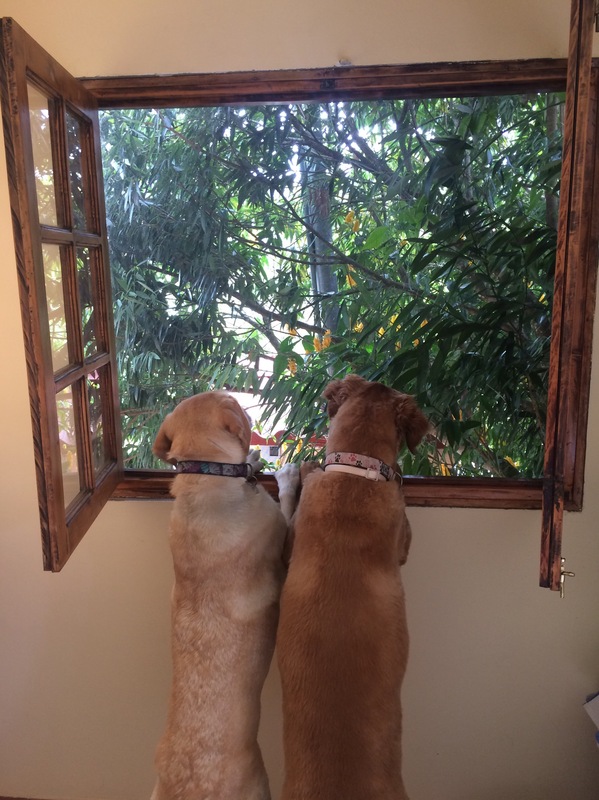 Sounds like you guys are really settling in even Maggie and Rosie – we love the picture of them looking out the window ( thats a keeper) We could do with some of that rain here though we are promised some for tomorrow. Can’t wait to come visit you guys sometime! We miss you both! Come see us. We are so happy for you and continue to live vicariously through you. Love from the Fort. Aww! Love back to you and Angie. Come see us! Sweet picture of the dogs and window! We used to have a lab but she sadly passed away. I love davidfranklin’s idea of the “why” you chose different things. For me, the produce would do it, lol, as we are vegetarians. Looks fabulous! Aww, sorry to hear about your pup. I wish they could live forever, or at least as long as we do! We’ll be posting “how tos” on just about everything as we gain more experience. Thanks for the comment, Shannon! Hugs back. It never ever ceases to amaze me the people we bump into at Westland Mall or in the city! We live near San Carlos/Coronado, and we are loving retirement life, too. 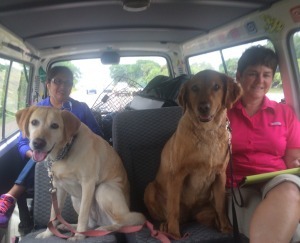 Glad your puppies were so safe and your travels to Boquete went so well! Thank you!! It’s sooo good to be here. Funny trying to see this whole thing through the dog’s eyes. Riding around on the bus, hanging around the terminal waiting for my bus back home, or walking around downtown David, I often try to imagine seeing it through the eyes of my friends back home. Things like the hand painted sign of the InterAmericana about some property for sale that says SE VENdE (in two different spots). The mountains in the distance. The little dirt roads leading off who knows where with an indigenous woman and her kids in their distinctive Ngabe dress. These things are so common to me now, but I still wonder how my friends would react to these things. Ha! Don’t know how I missed your comment earlier. I was thinking about what you said today, too – there’s so much to take in here and it’s so difficult to describe it to folks back home in a way that really captures it. It’s as you said on Facebook – we’re not in Kansas anymore! Yeah, you’re here! It’s such a happy place to be and life is indeed good. BTW, Joel loves his new toy and has been shining his bright light all over the place. Ha, men and their flashlights 🙂 Glad he likes it. Hi Kay! So good to hear from you. Sorry we didn’t get to say goodbye but our last couple of days there were beyond crazy and stressful. Please do stay in touch and come see us sometime!